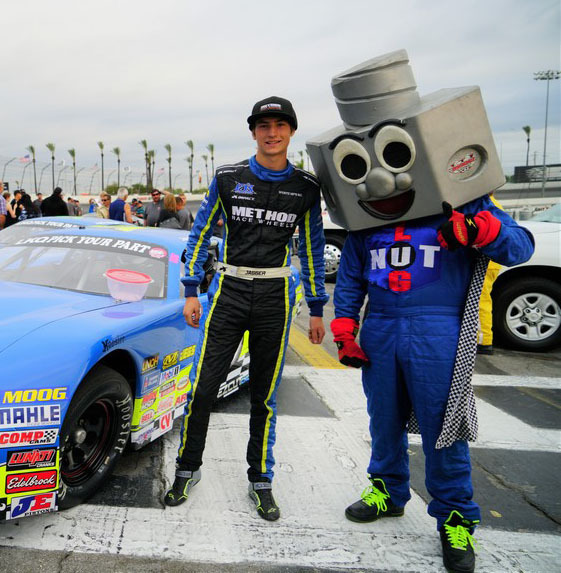 Irwindale, CA – The K&N Pro Series, West division will make its return to the famed Irwindale Speedway on March 30, 2019 for the NAPA Auto Parts 150. Joining the night will be a few extra activities that will help bring a full evening of entertainment to the automotive entertainment venue. Irwindale Speedway has become famous for the Night of Destruction presented by LKQ Pick Your Part and we hope to introduce that to NASCAR fan and vice versa. The evening will kick off with 150 laps of high horsepower K&N Pro Series cars. The series will see some shake ups with drivers and with Irwindale being the first asphalt stop on the schedule it’s sure to be a great night. Two Irwindale Speedway veterans will contest a K&N Series car at Irwindale for the first time. Hailie Deegan, the first female driver to win a K&N Pro Series Race will return to Bill Macanally Racing in 2019. Hailie contested in several late model races at the half-mile during her rookie season in 2018. Her best finish was a fourth. Also, moving up to the K&N Pro Series, West division in a Sunrise Ford Motorsports car will be the number 6 of Jagger Jones. Jagger has raced late models at Irwindale Speedway for the past two years. Jagger finished the 2019 points Championship at Irwindale Speedway in the 5th spot and earned his first Late Model victory in September of 2019. It was announced in January He will be driving the #6 car with sponsorship from XYO Network and Sunrise Ford. Three time track Champion at Irwindale Speedway, Trevor Huddleston, won’t be making his first run in a K&N Series car this go around, but he will be moving into a new car for the race. After spending the 2018 season behind the wheel of the #22 Sunrise Ford Motorsports car, Trevor will move into the #9 car to make a run at the Championship. Another notable driver will be that of Brittany Zamora. Zamora competed in a combine held by Toyota at Irwindale Speedway durin g the summer of 2018. Her impressive skills behind the wheel of a Late Model and her ability to adapt to the track in her first outing there impressed the director of team and support services for Toyota, Jack Irving. Zamora was announced to driver for BMR in the #99 car in January. 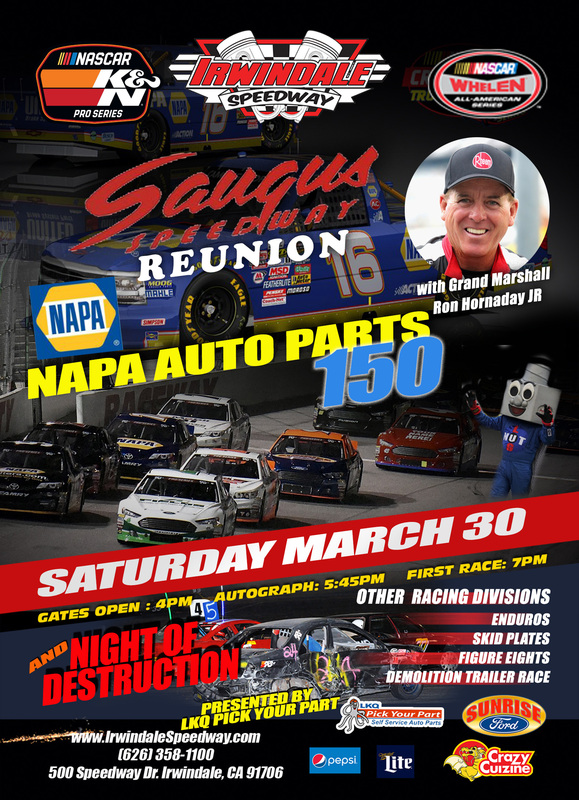 From the Rookies to the Veterans, those who hold a place in their hearts for the now-closed Saugus Speedway are invited to join together in a reunion. Food and Beverages will be made available in a special hospitality area. A pre-sale ticket is all you need to enter the gates 2 hours early on Saturday at 2PM to join fellow racers, fans and NASCAR Hall of Famer, Ron Hornaday Jr for a fun filled time of bench racing. Ron Hornaday Jr will also serve as the Grand Marshall for the NAPA Auto Parts 150. All this and we haven’t even mentioned the good times of the Night of Destruction presented by LKQ Pick Your Part which will see Skid Plate Cars, Enduro cars, Figure 8’s and a Trailer Destruction Derby. We’ll wrap it all up with a great FIREWORKS show before. Pre Sale tickets are available now, for just $15.00. General Admission. Click Here to Purchase. Suites and Group rates are also available by calling 626-358-1100. A Special Thank You to all of our partners at Irwindale Speedway for making this possible: Sunrise Ford, High Point Distributing, LKQ Pick Your Part, Lucas Oil, Miller Coors, Pepsi, Crazy Cuisine, Wood Electric, Clean Out Plumbing, Sharky’s Scuba and Swim and Pinnacle Peak Steak House.